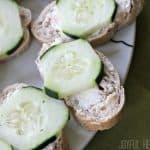 These cucumber sandwiches are packed full of flavor and are an easy appetizer with only 4 ingredients! They’re perfect for party appetizers and so good! Wash and thinly slice a cucumber. Slice a whole wheat loaf of french bread into 1/4″ slices. Once all components are ready, spread a little bit of the cream cheese mixture on a slice of the french bread. Top it off with a slice of cucumber.